581 pages | 174 B/W Illus. Cereals, legumes, oilseeds, fruits, and vegetables are the most important food crops in the world, with cereal grains contributing the bulk of food calories and proteins worldwide. Generally, the supply of grains and other food can be enhanced by increasing production and by reducing postharvest losses. While food production has increased significantly over the last few decades, minimizing huge postharvest losses as well as utilizing their by-products/wastes is the optimal way for a country to become self-sufficient in food. Postharvest Technology and Food Process Engineering combines these two subject areas as it covers both the primary processing of cereals, pulses, fruits, and vegetables and utilization of by-products/biomass. The text covers grain structure and composition, psychrometry, the theory and methods of grain drying, and design, testing, specification and selection of grain dryers. It describes processes such as parboiling of grain, hydrothermal treatment of grain, and milling of rice and other grains and pulses. The text also addresses biomass utilization and conversion technologies for energy, chemicals, food, and feed. 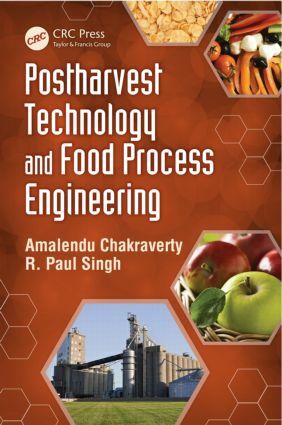 The final section on food process engineering examines postharvest management including cooling, and packaging, and discusses preservation and processing, factors that affect deterioration, and various industrial preservation methods of fruits and vegetables. It also provides an overview of food chemistry and covers food engineering operations, including fluid mechanics and heat transfer. Amalendu Chakraverty, a former professor at the Indian Institute of Technology at Kharagpur, was engaged in teaching and research in postharvest technology and food engineering for nearly 30 years. He had the opportunity to be associated with the rice/grain, fruit, and vegetable processing industries for a long period and visited various rice milling/processing machinery manufacturing industries in Japan and India. Dr. Chakraverty has completed a number of national research projects and published about 100 papers on grain drying, parboiling, and milling and their by-products in reputed national and international research journals and proceedings. He has also contributed chapters in books and has authored several books on various aspects of postharvest technology and biomass utilization technologies.